Bob, Helen, and their three kids look normal. They certainly live a normal life; bickering like normal people and have problems like normal families. Except for the fact they all have super powers. Bob and Helen were Mr. Incredible and Elastigirl when Supers were still legal. Now, saving the world is kind of like the family business. The Incredibles wear super suits made by famous designer, Edna Mode. Each of them wears a red long-sleeved spandex suit with black details. They also wear black gloves, black boots, and black eye masks. 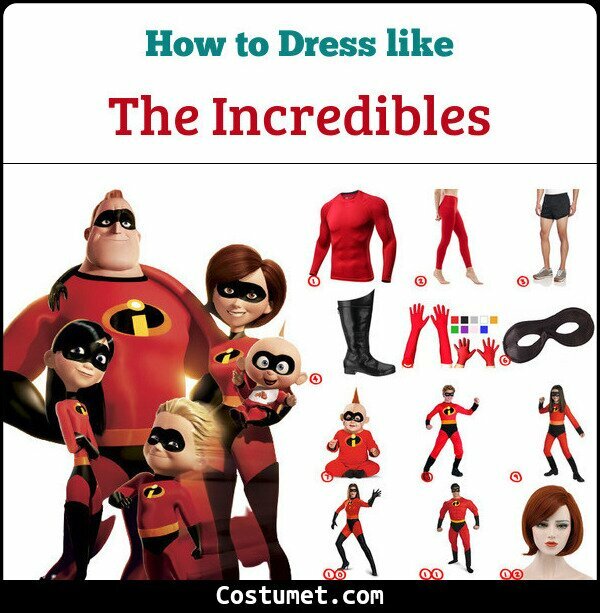 Here’s everything you need to look like The Incredibles. 1 Red Compression Shirt Wear this red compression shirt as a great outfit base. 2 Red Compression Tights Match your shirt with a pair of red compression pants. 3 Short Black Shorts Wear a short pair of black shorts to copy the Incredible’s costume detail. 4 Black Boots Don on black boots before you fight villains. 5 Black Superhero Gloves A pair of black gloves will help protect your hands from harm. 6 Black Half Mask Hide your identity behind a black half mask. 1 Jack Jack Costume Set Make your baby go as Jack Jack in this awesome costume set. 2 Dash Costume Set Let out your little boy’s inner Dash with this set. 3 Violet Costume Set Channel Violet’s aura in this outfit. 4 Mrs. Incredible Costume Set Stretch and fight crime in this Mrs. Incredible costume set. 5 Mr. Incredible Costume Set Feel super strong in this Mr. Incredible costume set. 6 Mrs. Incredible Wig Wear this wig to get Helen’s signature ginger hair. 7 Violet Wig This straight black wig is so like Violet’s hair.